One week after the official start of winter in 2018, three of us participated in the annual National Audubon Society’s Annual Christmas Bird Count. We saw dark-eyed juncos, black-capped chickadees, white-breasted nuthatches, downy woodpeckers, hairy woodpeckers, pileated woodpeckers, brown creepers, crows, ravens, and a red-bellied woodpecker. Those were animals we were expecting to see. What we didn’t expect to see was a Green Frog swimming along the shore of Rocky Pond, in a very small area where the pond had not frozen over. The frog looked emaciated and was swimming weakly. 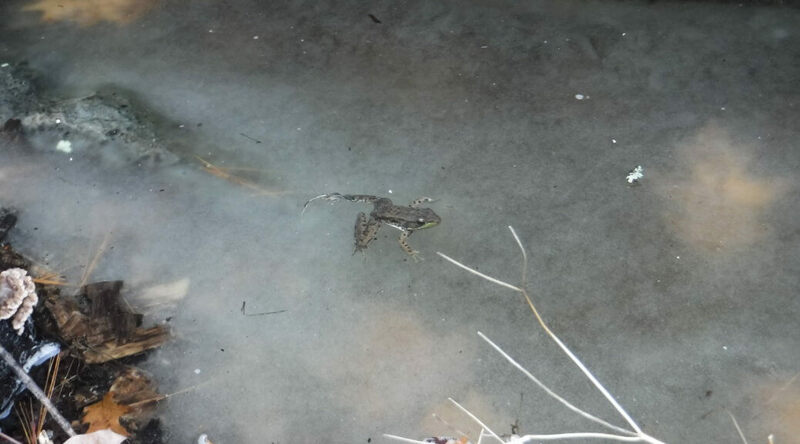 My guess was that it was hibernating in the mud at the bottom edge of the pond, but a recent warm up in weather had thawed the area and freed the frog from its frozen cell. Squirrels could still be seen scurrying about the forest on Dec. 29th. Small streams were flowing throughout the park. By the final day of December, the forest had become very quiet and the only birds I saw on my 3 hr. hike that day were a hairy woodpecker and a black-capped chickadee. Jan. 2nd found the forest floor bare and temperatures in the low 20’s. Both ponds were completely frozen over. At both ponds, cracks, booms, bangs, and sloshing could be heard as the water underneath the ice was moving here and there. By Jan. 5th, a light dusting of snow could finally be found covering the forest ground. Temperatures were in the low 30s and small park streams were gently flowing. Thick ice covered both ponds. Birds seen included Hairy and Pileated woodpeckers, tufted titmouse, black-capped chickadee, and white-breasted nuthatch. On Jan. 19th, a few inches of snow now covered the lower trails, while upper trails had 6 inches or more. Very quiet in the forest, with a major snow storm to reach the park the next day. Single digit temperatures on this day, also. Saw only hairy and pileated woodpeckers and crows. Lots of deer, squirrel, and predator(fox and coyote, mostly) tracks seen in the snow. Many spots could be seen where deer were digging through the snow to get to their ground food. One week later, temperatures were in the teens, and snow was averaging about a foot in depth. Birds seen included crow, hairy and pileated woodpeckers, and white-breasted nuthatch. I was very surprised to hear mourning doves “cooing” near Rocky Pond, so early in the season. Snow fleas could be seen for the first time at the base of some trees. Many gray squirrels were seen, along with their dug-up food caches. Many deer and fox tracks also seen. The first week of Feb., sound snow depth averaging about 1 ft. A new HUGE pileated woodpecker hole could be seen high up in an oak tree half way up the Upper Giorgetti Trail.Just looking for the carpenter ants they so relish. Saw crows and a hairy woodpecker, and watched a barred owl perched high in an oak tree, then was amazed to see it “spit up” a pellet. I collected the pellet, took it home and dissected it, finding the bones of 4 small mice in the pellet. Made me wonder, how a barred owl can hear mice scurrying about under at least 1 ft. of snow. Their hearing truly is as amazing as ornithologists say it is. Feb. 16th found many of the trails covered in ice. Had to use my boot ice straps to safely get about. Sunny day, but temps. in the low 30s. Hairy and pileated woodpeckers, crows, and white-breasted nuthatches seen. Beavers very active at the 3 dams at the Rocky Pond outlet. Both ponds frozen over, but Rocky Pond outlet stream was flowing surprisingly high. Lots of deer and squirrel tracks. The first week of March found temperatures in the low 30s, and snow depth averaging 6 inches. Black-capped chickadees, white-breasted nuthatch, tufted titmouse, crow, and hairy woodpecker all seen. Barred owl seen near the top of Upper Giorgetti trail. Gray squirrels seen throughout park, and Rocky Pond completely frozen over and covered in snow. March 9th was a beautiful day, with the park covered in a few inches of snow, with the exception of a few south facing slopes which showed bare ground. Many gray squirrels seen throughout park and both ponds completely covered in ice and snow. Tufted titmouse singing, and crows, white-breasted nuthatch and black-capped chickadees flying about. Lots of deer, predator, rodent and squirrel tracks seen. Bobcat tracks on Ridge Runner trail. Park streams frozen over. And a Wooly Bear was photographed by Lauren White sitting on the snow at Rocky Pond. By March 17th, temperatures had been reaching into the low 60s, and most of the snow on the lower Giorgetti trails had disappeared, with only a few patches of snow. Upper regions of the park were covered in a few inches of snow, with patches of bare ground found here and there. Crow, hairy woodpecker and tufted titmouse were the only birds seen. That’s it for this issue. Enjoy your time at Pine Hill Park, and please remember to stay on the trails.